I feel that reviewing this is like preaching to the converted, but here goes. If you have somehow missed out on the My Little Pony: Friendship Is Magic TV animation phenomenon so far, here is a good place to start. 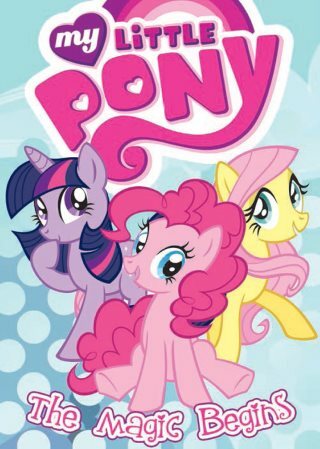 This book – and it is a cute little booklet, appropriate to the TV cartoon series; only 6.8” x 5” and brimming with color on glossy paper – is a graphic-novel adaptation of the two-part Friendship is Magic pilot episode broadcast on October 10 and 22, 2010. 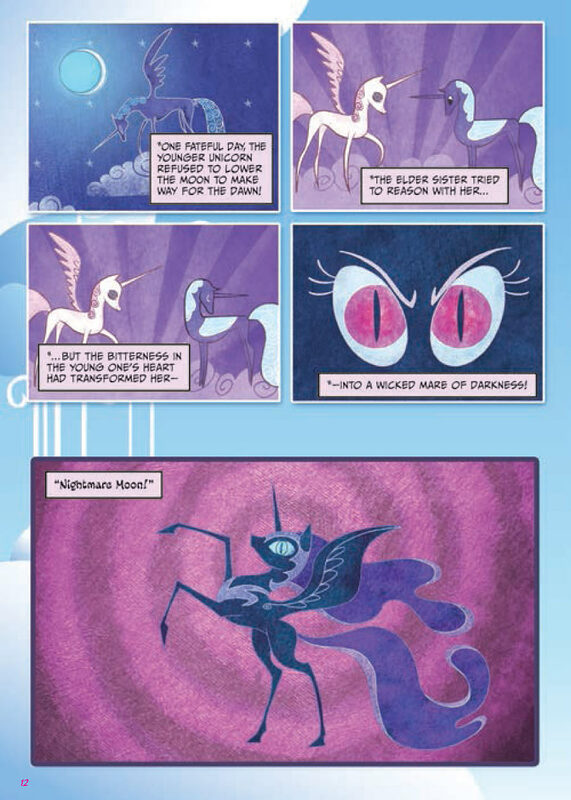 The story is by Lauren Faust, MLP:FIM’s creator, adapted into graphic-novel form by Justin Eisinger. Other credits are on the title page. This booklet consists of stills from the two TV cartoons with speech-balloon overlays; about as close to putting an animated cartoon onto paper as you can get. If you do not have a videotape or DVD of the first two episodes, this will enable you to have them. IDW Publishing is the publisher of the MLP:FIM regular comic book, but this booklet is not a regular comic book. It is a cross between a standard American comic book and a Japanese tank?bon paperback, shrunk to about half-size, in glossy full-color on slick paper; more like the paperback photo-novels of Doctor Who, Star Blazers, or Star Trek episodes than a collection of comic-book issues. “My Little Pony: The Magic Begins”, by Lauren Faust (author) and Justin Eisinger (adapter). San Diego, CA, IDW Publishing, October 2013, trade paperback $7.99 (124 pages). 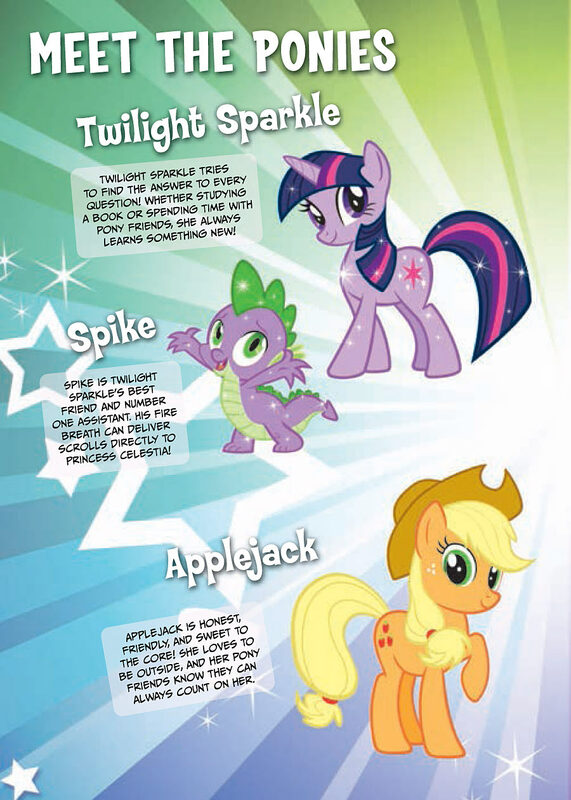 My Little Pony: The Magic Begins introduces the magical land of Equestria and the six featured ponies. 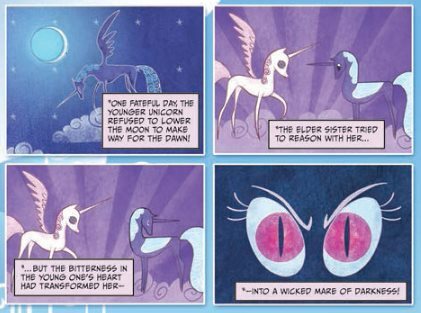 An introductory flashback establishes that at the beginning of time in Equestria, the land was ruled by two sister goddesses, who later became known as Princess Celestia and Nightmare Moon. The first brought the day; the second, the night. All was well for millennia while they were equal, but the younger sister eventually became jealous because most ponies liked the day better than the night. She tried to use her magic to freeze Equestria into eternal night. This led to a battle between the two that Nightmare Moon lost. She was banished to the Moon, and Princess Celestia took over both sisters' duties, maintaining the equal division of day and night. 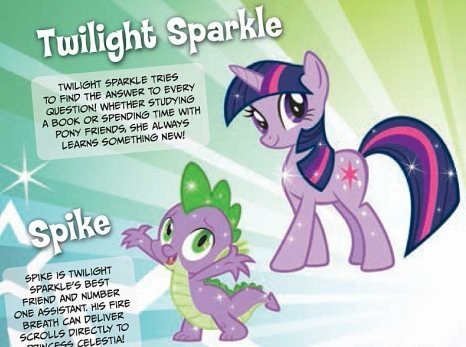 In Equestria’s capital of Canterlot, the royal librarian is Twilight Sparkle, the purple unicorn pony, with her assistant, Spike the baby dragon. Twilight Sparkle has the unfavorable reputation of being an aloof bookaholic who spends all of her time reading, and considers friendship with the other ponies to be frivolous. One day Twilight learns that there is an ancient, forgotten prophecy that Nightmare Moon may be able to escape. Legend has it that on the longest day of the thousandth year, the stars will aid in her escape, and she will bring about night-time eternal. Twilight tries to warn Princess Celestia, but the Princess dismisses her worries. and Pinkie Pie, a pink (naturally) pony who insists on holding a big party to welcome Twilight and Spike to Ponyville. With all the distractions, Twilight Sparkle is just too late to keep Nightmare Moon from escaping and plunging all Equestria into darkness. Twilight, Spike, and the other five ponies undertake a mission to recapture Nightmare Moon and return daytime to Equestria. This is what launched the series, which is now up to 65 TV episodes, the Equestria Girls theatrical feature [review], a ton of plush dolls and other merchandising, the fan conventions, and the Brony movement. The TV series is produced in Flash animation. Frankly, Flash animation does not look as good as traditional animation on paper, without the movement to distract the viewer from its simplicity. But the colors are bright. As I said, this is a good booklet to introduce anyone to the series. It does contain two misspellings right at the beginning -- "Esquestria" and "Centerlot" -- that may mislead the uninformed as to these places' true names. We will not be fooled, of course. The MLP:FIM fans may be too enthusiastic. Or is the notice, “IDW Publishing does not read or accept unsolicited submissions of ideas, stories, or artwork.” (p. 2), in all of IDW’s publications? I've never noticed any notices in other IDW comics; that's pretty funny, and kind of sad. Of course, I don't read their Star Trek or Dr. Who comics, which probably have similar problems; I wonder how many Dr. Who/Hooves crossovers they had to reject. This form factor is industry-standard for Beginning Readers books for children, which is the audience it's packaged for.